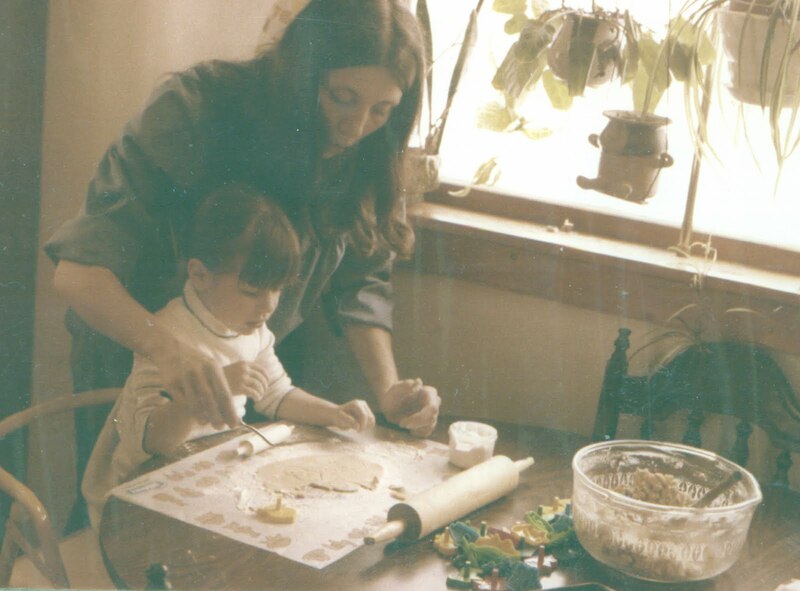 My fondest childhood memories are of my mom and I in the kitchen. I look at this photo and remember the thousands of cookies I have seen her bake. I always relished the intimacy of watching her while she worked. The way she silently read the recipe to herself, her lips moving as she formed the words. She'd have her left hand on her cookbook, her right hand would drift up to her mouth, where her index finger would rest on her top lip. She would tap her finger on her lip as she thought, and I would feel the anticipation rising as she got down to business. She is meticulous; measures carefully, and assembles all of her tools and ingredients before she begins. When she forms a cookie into a ball, or rolls dough out for cutting, her hands move with such gentleness, such grace. The dough seems to willingly submit to her touch. Of all the cookies people receive as gifts, or at Christmastime, my mother's are the ones they are excited to eat. Her cookies do not get taken to the office the next day and left in the break room, "because really, who needs the calories?" They are devoured. Too often, in one sitting. I have a favorite story about baking with my mom. I was little, younger than the photo above. I was sitting up on a stool at the counter "helping" her. She kept flour and sugar in these large Tupperware storage bowls. I reached to the bowl on the counter in front of me when mom wasn't looking, and grabbed a handful of white powder. I quickly shoved it all into my mouth, thinking it was sugar. My satisfaction at having pulled one over on mom didn't last long. My eyes teared up, and I started to cough, plumes of flour puffing from my surprised mouth. My mother laughed as she pounded me on the back and forced me to sip water. She says she was afraid at first that I would choke. But as my expression changed from panicked, to confused, to indignant, she realized I'd be all right. She never gets tired of telling that story, and mimicking the sounds and faces I made as I coughed up the last of that flour. I don't get tired of hearing it either, or at laughing at myself. I don't remember that day, but in my mind's eye, I can visualize reaching for that big Tupperware bowl, with an expression of mischievous and satisfied delight. The recipe is a snap; mix dough, form into balls, roll in cinnamon-sugar, and bake. Wow... these are the best cookies I have ever made. Picture the scene. It's early on Sunday morning, the neighborhood is quiet, and the husband is still asleep. The apartment is filled with the warm, toasty scent of cinnamon. The first batch of cookies comes out of the oven. They are perfect. The bottoms are the exact same color as the tops. The exterior of the cookie is crispy with cinnamon sugar. The inside is moist and oh so tender. When you break the cookie in half, you hear a delicious sound. It is the sound of a rich, buttery kiss. Of all the things I've learned from my mother, learning to bake ranks high on the list. The woman does it right; meticulously, carefully, and with a generous measure of loving care. Every time I eat a Snickerdoodle I am transported into the past. I'm a little girl again, sitting on a high stool in my mother's kitchen. I eat my cookie with that same smile of satisfied delight, and bask in the memories of my fortunate and happy childhood. My only regret on this Mother's Day is that I am in Seattle, and my mom is at a casino in Windsor Ontario living it up. I really hope she wins big. She deserves it. Happy Mother's Day Mom. I love you. Heat oven to 400 degrees. Mix shortening, 1 1/2 c sugar, and eggs thoroughly. Blend flour, cream of tartar, soda and salt; stir in. Shape dough in 1" balls. Roll in cinnamon sugar mixture. Place 2" apart on ungreased baking sheet. Bake 8 to 10 minutes. The cookies will puff up at first, then flatten out. Makes 6 dozen cookies (according to the recipe, but myself and others have found it comes out closer to 3-4 dozen). Occasionally life gets away from me. Time itself moves too quickly. Monday morning, alarm goes off, I grind through my routine. Jog to the stop to catch the bus downtown. Eat breakfast at my desk, slurp coffee, send email. Work work work, email email email. The day is over before I know what happened, and I'm back on the bus home. Before I've had time to think, four more such days have come and gone, and the weekend is here again. I question what I have really accomplished. I wonder what I can get done in two days, to make up for the five that seem to have slipped through my fingers. Then Saturday is here, and I awake with a feeling of restlessness bordering on panic. An energy like high powered steam courses through me. I'm locomotive. I add some caffeine, and if you know what's good for you, you'll stay out of my way. Clean out the bookshelves, three boxes of books for donation. Clean out the closet; four bags of clothes I have compulsively kept for years, but do not wear. Clean the bathroom; floor to ceiling. Six loads of laundry. Grocery shopping. Vacuum, dust. My husband eyeballs me warily. He's doing his best to steer clear, lest there be a fiery wreck. I feel a little sorry for him. A little. After all that I needed a treat, so I went shopping for kitchen stuff. I've been meaning to get a new crock pot for a while, and figured this was a good time. I knew I wasn't going to be in the mood for a complicated recipe that weekend... I found one I liked and brought it home. As I was flipping through the booklet that came with the pot I saw a recipe for Carolina Barbecued Pork that sounded really delicious. As I had already expended several days energy in a Spring cleaning frenzy, I went with it. I have no regrets. Unlike Saturday, that Sunday was pure lazy bliss. I slept late. Around noon I rolled into the kitchen and started to get my act together. Chop, rub, mix. Put in crock pot. Turn on. Return to couch to read books and watch movies and look at clean apartment. After two hours it smelled so good... Six hours later I moseyed back into the kitchen. I took the pork out and lest it rest until it was cool enough to handle. I tore it apart with my hands. I ate it. This pork was the most tender, slightly sweet, slightly spicy, porky goodness that you can possibly imagine. I love bbq of any kind, but pulled pork is my absolute favorite. I particularly love it when topped with a sauce that has a good vinegary kick, to balance out the richness of the pork. This recipe has it all, and I will definitely be making it again. I might tweak a thing here or there, and will make suggestions below, but overall I was very pleased with the final product. Go Crock Pot and your accompanying recipe booklet! I served the pulled pork on hoagie rolls and made some cole slaw to go along with. I like my cole slaw on the sandwich itself. Crunchy, vinegary slaw contrasts beautifully with the rich, tender pork. The onions cooked with the pork were delicious, as was the reserved marinade that you drizzle as a sauce over the final product. The marinade is full of flavor, but I found myself wanting it saucier, so added some Stubb's Spicy BBQ. This sandwich was so delicious, so easy, and so satisfying. Next time you know you'll be busy, or you feel a psychotic cleaning frenzy coming on, get this going in the background. You won't regret it either. Place the onions in the crock pot. Combine brown sugar, paprika, salt and pepper and rub the mixture over the roast before putting in pot. In a bowl, combine the vinegar, Worcestershire sauce, red pepper flakes, sugar, mustard, garlic granules and cayenne pepper. Mix well. Drizzle 1/2 of the vinegar mixture over the roast. Cover and refrigerate the remaining vinegar mixture. Cover crock pot and cook on low for 10 hours, or on high for 6 hours. Remove the meat and onions and drain. Separate meat from remaining fat and then pull apart with your fingers. Serve pork and onions on buns, topped with vinegar mixture.